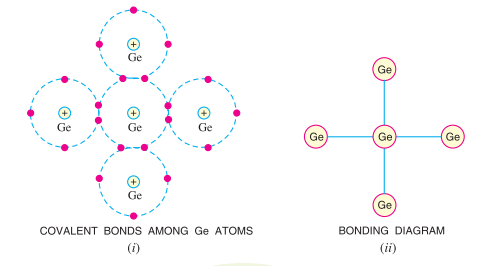 Bonds in Semiconductors: In semiconductors, bonds are formed by sharing of valence electrons. Such bonds are called co-valent bond. 1. Co-valent bonds are formed by sharing of valence electrons. 2. In the information of co-valent bond each valence electron of an atom forms direct bond with the valence electron of an adjacent atom. In other words, valence electrons are associated with particular atoms. For this valence electrons in a semiconductor are not free.